And they recreated one of their newest commercials with it. You may have seen one of Chevrolet's recent commercials that feature a focus group made up of "real people, not actors." In one of these adds, Chevy has a de-badged Malibu that the group insists is way more premium than anyone with common sense should know. That particular commercial wasn't very believable to us, but the ad campaign has been doing well for Chevy. GM has now partnered with Warner Brothers to promote the new Lego Batman Movie by recreating the focus group with the toy builder. The commercial is pretty hilarious, and features animated Lego figures instead of live-action people. Also, instead of showing off a Malibu, Chevy shows of its full-sized Lego Batmobile which was actually built for the first public day of the Detroit Auto Show. The Lego Batmobile is made from 344,187 bricks and took 1,833 hours to build. "To work on the Lego Batmobile with Warner Bros. is an absolute thrill for us at Chevy," Paul Edwards, vice president of Chevrolet marketing, said in a statement with Automotive News. "Many of the themes in The Lego Batman Movie, like imagination, family and community, align perfectly with our Chevy brand values and add to the value of the partnership." The goal of the commercial is to promote the movie and get a few laughs. 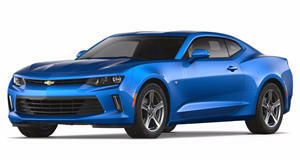 Unfortunately, Chevy won't put the car into production, although you can configure one on Chevy's website. When you go to build one, you can choose one of 13 colors, but they are all different shades of black. The MSRP is $48,000,000 and it comes with a 60.2-liter V100 engine with 20,000 hp. Chevy says it can tow 120,000 lbs max and it even has the brand's 4G LTE Wi-Fi connectivity and Apple Car Play Connectivity.